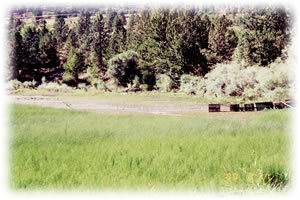 An oxbow feature in the North Thompson River lowlands. The oxbow fills in spring freshet and dries through the summer, to create a seasonal range of riparian habitats. There are no facilities at this park as it is a riparian habitat and covered by water for approximately four (4) months of the year. 24 km north of Kamloops off Westsyde Road. The park can only be accessed via private land. The closest communities to this park are Kamloops, Barriere and Clearwater. History: Established April 30, 1996 as a result of recommendations made in the Kamloops Land and Resources Management Plan. Conservation: The oxbow fills in spring freshet and dries through the summer, to create a seasonal range of riparian habitats. Wildlife: Rich oxbow, marsh and wetland habitat for waterfowl, otter and beaver. A migration stop for white pelican, tundra and trumpeter swan, migrating passerines and waterfowl. Possible chinook salmon spawning. The approved North Thompson Oxbows Jensen Island Provincial Park Management Direction Statement [PDF] is available online in pdf format. Canoeing permitted but no access through adjacent private land. There are wildlife viewing opportunities from Highway 5 (Yellowhead) and from Westsyde Road. Surrounding private land limits access to this park.